The last couple of days we have read reports saying that the potential new Chinese owners of Saab are looking into alternative ownership structures to please both General Motors (GM), which Saab still needs to buy technology from, and Chinese authorities. Now Dow Jones Newswires reports that Chinese vehicle distributor Pang Da is open to discuss its planned stake in Saab. "From Pang Da's perspective, what we're trying to accomplish is to come up with a plan that can save Saab," secretary of Pang Da's board of directors, Wang Yin, told Dow Jones Newswires. One possible ownership structure which has been mentioned is Pang Da and Chinese vehicle manufacturer Youngman taking a 20 percent stake each, and leaving the rest for one or more Chinese investment funds. "What kind of stake Pang Da can eventually take in Saab is of secondary concern," Wang Yin said. Wang Yin also said that the news report that Pang Da would take a 20 percent stake was "inaccurate." But from General Motors point of view nothing seems to have changed. "GM has not changed its position," spokesman James Cain told Dow Jones Newswires. And Saab's CEO and Chairman Victor Muller can't be surprised by GM's attitude. To Teknikens Värld Muller said "I understand GM fully, it is obvious that they do not want to risk their market in China". Muller said that he does not believe that GM will approve the potential Chinese owners. And Muller can not understand why the Chinese keep pumping money into Saab. "It's like putting money into a black hole", Muller told Teknikens Värld. So GM still skeptical, and the Chinese willing to discuss the ownership structure, that's where we're at. The question is if we can get to a point where everybody is happy before it is too late. Chinese regional investment fund takes majority stake in Saab? Yesterday we got reports that the Chinese are reconsidering the proposed ownership structure of Saab. It was said that the vehicle manufaturer Youngman would take a smaller stake than originally planned and thus reduce its ownership to a minority stake. At the same time there were talks about possibly a Chinese regional investmen fund entering into the deal. Today Swedish Radio SR reports that according to Dagens Industri, a third party, probably a regional investment fund, could take as much as 60 percent of the ownership in Saab and thus reduce the stakes of Youngman and the vehicle distributor Pang Da to 20 percent each. This deal would mean that neither Pang Da nor Youngman would alone or together get a stake that would give them control over Saab. It is believed that this is the new ownership structure that the court appointed administrator of the Saab reconstruction, Guy Lofalk, presented to representatives from General Motors when he visited Washington yesterday. "Guy Lofalk's proposal is really a trial balloon to GM to get feedback on what they can accept to get the negotiations going", a source said to DI. Saab's current CEO, Chairman and major owner Victor Muller writes in a text message to Dagens Industri that "there is always a plan B". Earlier today we could read that the court appointed administrator for the Saab reconstruction currently is in Washington with Sweden's ambassador to the USA meeting representatives from General Motors. The aim to convince GM to keep supplying Saab with technology should Saab become fully Chinese owned. "That's impossible to say. This is a issue between GM and the Chinese." And if the deal falls through, Muller wrote that there is always a plan B. On Friday Norwegian and Swedish TV viewers can see Victor Muller answering even more question, albeit probably questions about how his life has been the past year or two. On Friday both Swedish TV SVT1 (at 21:00 CET) and Norwegian TV NRK1 (streaming at 21:25 CET) will broadcast the entertainment talkshow Skavlan, where the Norwegian TV host Fredrik Skavlan will have Victor Muller as guest. So my Norwegian and Swedish readers should absolutely check out SVT1 or NRK1 on Friday. And if you are not in Sweden or Norway, you can try to access the show by following the above link to NRK1, but it will probably only be available for Norwegian and Swedish Internet users. Saab has just annunced in a press release that Saab Great Britain Ltd, which is a susidiary of Saab Automobile AB's parent company Swedish Automobile NV, today filed for administration with the High Court in London. In other words, the company has asked the court to be protected from its creditors and thus from bankruptcy until the required funding for the company has been secured. To my humble knowledge, an administrator will take control of the company if the court decide that the administration request is to be approved. According to TTELA, Saab's court appointed administrator of the reconstruction process, Guy Lofalk, is in the USA to meet representatives from General Motors (GM). He is currently in Washington with Sweden's ambassador to the USA, Jonas Hafström, and together they will try to convince GM to accept the deal where Saab is sold to China. Furthermore, Dagens Industri reports that sources say that a third party is also possibly coming into the deal where Saab is sold from Swedish Automobile to Chinese parties. By allowing a third party into the deal, and at the same time reducing Youngman's stake so that the company does not become majority owner of Saab, the Chinese hope to construct a new deal that GM can accept. According to DI, GM objects Youngman becoming majority owner of Saab, and at the same time China's National Development and Reform Commission (NDRC) request that the Chinese take full ownership of Saab in order to approve the deal. By introducing a third owner the Chinese hope to please both GM and the NDRC. The Chinese are said to explore the possibility for regional Chinese state funds to take part of the deal. Talks are probably being held with funds in the Ordos province in Inner Mongolia, where Youngman has factories located. A couple of weeks ago Svenska Dagbladet presented a grainy picture of what was believed to be the upcoming Saab 9-3 replacement. Since then we have seen impressions of this new car from both AutoExpress and AutoWeek. Today I bring you some new impressions from Teknikens Värld. They write that the 9-3 that was already designed when Jason Castriota arrived at Saab looked too much like a scaled down Saab 9-5. And therefore Victor Muller gave Castriota the task to give it a new design. And in my opinion, this impression looks too much like a scaled down 9-5. Look at the front with the overhang, the window lines, the sloping rear. All 9-5. Don't get me wrong, I like this impression a lot. Especially the picture from the front angle, but I believe that the next 9-3 will look different. This one does stand out, though it's just a re-tweaking rather than a whole new car: a modified front bumper and lights, to bring it into line with its 9-5 big brother, and a range of more efficient engines. It may not be beautiful, but it is unmistakably a Saab, and it has presence – especially this XWD model, which has a slightly higher stance than the others. Rugged even, and outdoorsy, but without the stigma-as-standard you get with a large SUV. Talking about Saabs that stand out. 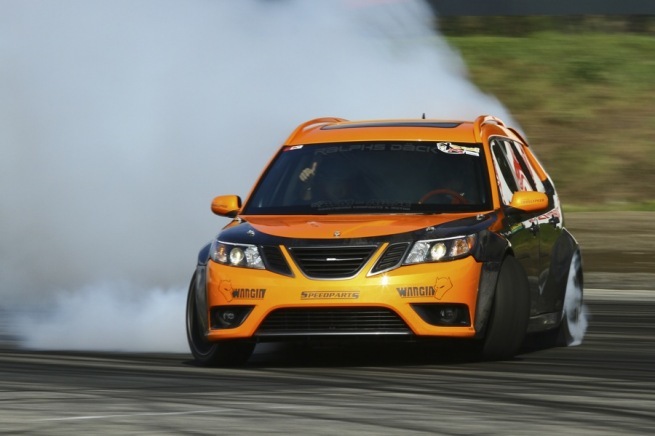 Check out this Saab 9-3 SportCombi drifting! After weeks of negotiations after General Motors said no to selling technology to a Saab owned 60 percent by Youngman and 40 percent by Pang Da, a new deal may be in the pipeline. According to Swedish business news site E24, Dagens Industri today writes that the Chinese vehicle manufacturer Youngman is now willing to take a smaller stake in Saab and let vehicle distributor Pang Da take a larger majority stake. The hope is that this will please General Motors enough to keep supplying Saab with tehnology licenses and the GM built Saab 9-4X. I guess next week will see more details on this new proposal. Also another word on the Antonov - Saab situation. Dagens Industri reports that the Latvian finance inspection, FCMC, says that it will not go after the EUR 72 million loaned from Antonov to Victor Muller's company Tenaci when Muller's Spyker Cars bought Saab. Yesterday Pang Da told Swedish television SVT that China's National Development and Reform Commission will not allow Pang Da to send more money to Saab to secure wage payments and keep the company in the reconstruction process. 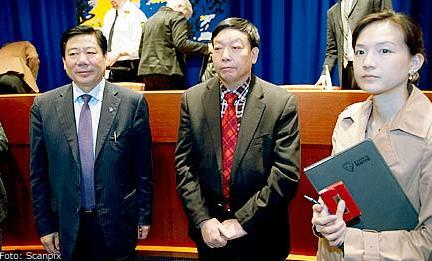 "We want to save Saab, but we can not," said Yang Guangy, spokesman for Pang Da to SVT. The NDRC has put the brakes on regarding more money transfers to Saab from China. When the Chinese plans changed from becoming part to full owners of Saab, the NDRC restarted the whole process of investigating the deal. And now noone knows when this process will be completed. "The NDRC is not transparent and it is hard to get information from them. Now we can only wait on a approval and until then we are not allowed to send any more money to Saab in Sweden," Yang Guangy said. A piece of good news is that the troubles former Saab suitor Vladimir Antonov has run into, has not made the Chinese less interested in Saab. As reported here earlier, Vladimir Antonov's banks in Lithuania and Latvia have collapsed and there are money missing. Money that some said could have gone to Saab. To Dagens Industri a source familiar with the negotiations between Saab's current owner Swedish Automobile and the Chinese suitors Pang Da and Youngman over the sale of Saab, says that the Chinese still want to acquire Saab. "It is not a decisive factor. It does not affect their wish to do business. When the Chinese have bough Saab there will be no relations between Swedish Automobile and the Chinese," the source told DI. But now more than ever, the Chinese want to be full owners of Saab and not just part owner. If they are full owners they can cut all ties to Swedish Automobile, Victor Muller and Vladimir Antonov. Question is if General Motors will sell technology to a fully Chinese owned Saab. "The willingness and the possibility to keep Swedish Automobile as a part owner is very limited now under the current situation," the source said. Even though the Chinese are saying that they can't send more money to Saab, Saab itself is still optimistic about raising the money needed for the wage payments. "We know that we can't pay exactly on time, but we are hoping that we can pay in the beginning of next week," Eric Geers told TT. "We will have to wait and hope that we can reach a solution that is acceptable for both the Chinese and GM." Saab now says that it will not be able to pay its employees the wages before this weekend. Saab's Executive Director Human Resources Johan Formgren says that the company has no further news about the wages. Let's hope something good can happen during the weekend. Aftonbladet reports that in London Vladimir Antonov has stood before the Westminster Magistrates' Court. As reported earlier, his banks in Lithuania and Latvia has collapsed and there are suspicions of fraud. Lithuania has asked that he is extradited. The English court has decided that these proceedings will take place in December. In the meantime, the court has decided that he can be let out on bail. In a text message to TTELA, Saab's CEO and Chairman Victor Muller, writes that the only connection between Swedish Automobile and Saab and Antonov's banks is a EUR 72 million loan given from Antonov's banks to Victor Muller's company Tenaci in February 2010. This money was used by Tenaci to buy Saab. That's the wrap up of today. Unless something big happens. Today is the day when the last MoU between Swedish Automobile and Youngman and Pang Da will expire. Earlier this week we learned that Pang Da was hoping to finalize the deal within today. But still there has been no word from General Motors if it can accept the deal. All we have heard so far is that they stand by their first "NO". Today local Trollhättan newspaper TTELA writes that Youngman and Pang Da on Wednesday was in a meeting with China's top economic planning body, the National Development and Reform Commission. It doesn't say what the issue at hand was, but in addition to the purchase of Saab, it would not be a big surprise if they also discussed how to help Saab pay the November wages to the employees. According to Anna Petre at Saab, these kind of meetings have taken place several times lately. On the other side of the world, in London, England, Vladimir Antonov was arrested by the police on Thursday night. According to different news provider, e.g. TTELA, his bank Snoras in Lithuania is missing $ 1.3 billion and his bank Krajbanka in Latvia is missing $ 191 million. The fear for us Saab enthusiasts is now that some of these money has found its way to Saab as loans not accounted for by the banks. (I am sure that in Saab's books everything is accounted for. After al, they are being checked continuesly by the Swedish Debt Office and the EIB). And now the banks will possible claim their loans back. I guess it is no big surprise that the wage payments to the Saab employees are late again. Payment to the blue-collar workers are supposed to happen tomorrow, and the white-collar workers are to be paid on Monday. Last night Saab informed its employees that the wages most probably will be delayed. "Yes, we have to warn for this even this time, as there is a risk that we can't get the funding on time," said Eric Geers, Executive Director Communications at Saab to TTELA. Saab could not say when the wages will be paid. One Saab friend who earlier has made sure that the funding to pay the employees were in place, is Vladimir Antonov. Now he is in trouble of his own. His Snoras bank in Lithuania was seized by the state and an arrest warrant for Antonov has been issued. Now Swedish news reports that the money "missing" from the bank can possible be linked to Antonov's funding of Saab. I don't know what is true or not about Antonov, but I know that he stood up for Saab when Saab had problems and I thank him for that. The Chinese are hoping that the deal to buy Saab together with an agreement with General Motors for the continued supply of technology will be finalized by Friday. That's according to a statement from Pang Da cited by Automotive News China. In the statement from Pang Da, it is stated that the memorandum of understanding signed between Saab's current owner Swedish Auttomobile and Chinese companies Youngman and Pang Da, a MoU which expired on November 15, has been renewed. The renewed MoU is valid until November 25. "All parties signing the memorandum of understanding have also agreed to seek to finalize and sign a share purchase agreement on or before November," said Pang Da in a statement. The past days we have gotten reports that Chinese companies Youngman and Pang Da together with Saab have sent a new offer to General Motors concerning GM approving continued technology licensing to Saab when the Chinese companies take ownership of Saab. Now Dagens Industri reports that GM, with public relations officer James Cain, reaffirms that GM will not continue the supply of technology or complete Saab 9-4X vehicles to Saab should Saab be fully owned by Chinese companies. According to Dagens Industri, the latest offer to GM included legal guarantees regarding the technology rights owned by GM, money offer to be able to use the technology, agreements about which volumes Saab could produce and how many years the technology licenses would be used. GM would not confirm that it had received such an offer. "We have communicated with Saab, but I will not make any further comments on that," James cain told DI. Mr. Cain also made it clear that as long as the Chinese want to buy all the shares in Saab, GM will not supply technology. "Let me be clear. Saab and Youngman can do whatever they sseem fit for the company. But if there is a one hundred percent takeover of Saab, it will happen without the vehicles we supply, 9-4X, and without GM's technology." It can't get any clearer than that. Either the Chinese realize that they can't get full control over Saab, or they have to make Saab cars without GM technology or they can give up on trying to acquire Saab. On Friday this week and Monday next week the wage payments are once again due at Saab. Now Swedish news agency TT has reached Rachel Pang from Youngman and she could tell that both Youngman and Pang Da are working to make sure the employees are paid their wages. "Both Youngman and Pang Da are looking for a way to pay them. We are discussing how to solve the issue," Rachel Pang told TT. A few days ago Saab and the Chinese sent an offer to General Motors regarding the issue of technology licenses so that Saab can continue building the Saab 9-3 and 9-5 as well as be supplied the Saab 9-4X from GM. So far there has been no response from GM. "No response yet," Victor Muller told TTELA earlier today. One thing that is clear is that the offer sent to GM does not include any changes in the Chinese plan to acquire 100 percent of Saab. Youngman and Pang Da are still aiming at owning respectively 60 and 40 percent of Saab. We have sent a new offer to GM, that we hope will please them. It is regarding additional commercial conditions," Rachel Pang told TT. The offer is said to be relatively general and open to negotiations concerning agreements on technology licenses and more. "We would like to meet them and we have asked for a meeting," Rachel Pang said. Swedish newspaper Dagens Industri reports that Chinese companies Youngman and Pang Da, still determined to buy Saab, have made a new offer to General Motors. The goal is to reach a deal where GM will continue supplying Saab with technology to built the Saab 9-3 and the 9-5 and keep up the deliveries of the complete Saab 9-4X. According to DI's source, even the Swedish government and the court appointed administrator of the Saab reconstructon are ready to go to Detroit to assist in the negotiations. But Saab's current CEO and major shareholder, Victor Muller, is believed to have a minor role in the process according to the source. "GM needs to go through the info it has received from Saab. It is up to the Chinese who they wish to be leading the negotiations with GM," Victor Muller said to Dagens Industri. Right now everybody is waiting for GM to make a move regarding the offer at hand. But this could take weeks. Luckily Chinese Youngman has decided to support Saab financially in the meantime, and yesterday transferred SEK 20 millions to Saab's account. It is expected that the Chinese will also cover the wage payments due on the coming Friday and Monday. Once again we have reached the week of the month that time after time has turned out to be the most nerve wrecking for anyone interested in Saab. The week of the wage payment. The magic number is approx. SEK 100 million. Money Saab needs to pay its employees the wages for November. The question is how much money does Saab have. Is it enough to cover wages? And if not, will a last minute solution be presented this time also? Best of all would of course be that we get a final and happy solution for Saab. During the weekend TTELA reported that the Chinese companies Youngman and Pang Da had sent addition information to General Motors. Information from the negotiations from the past week. 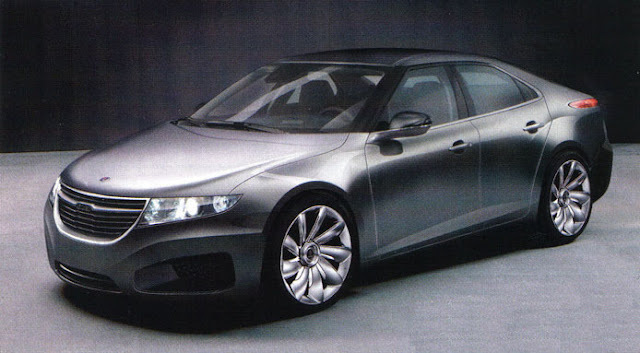 And just-auto writes that Saab has submitted a new proposal to GM. From the other side of the world in China, Youngman's vice president Huang Zhiqiang told Reuters that "All of the parties involved in a deal to invest in ailing car maker Saab are still communicating after the expiration of a memorandum of understanding last week". According to Huang,Youngman's determination to invest in Saab is a long-term strategic move. "It's not a short sighted move. We got into the deal as a long-term investor." It's good to get confirmation that the parties are still talking and are determined to find a solution. I guess we are in for one more week of anxious waiting. Earlier today we reported that Saab wanted to postpone the meeting with its creditors planned for Tuesday next week. Now TTELA reports that the meeting has been postponed. "First we want to sort out the issues with GM," Eric Geers, Executive Director Communications at Saab told TTELA. There has not been set any new date for the meeting. But there are currently intense negotiations ongoing to find a solution for Saab and the Chinese suitors that GM can accept. "Yes, the negotiations are intense. Everyone is 100 percent focused, we also have a dialogue with GM. We need to find a structure that suits everybody, including GM. That is the issue," Geers said. Swedish newspaper Svenska Dagbladet today has a very nice article about two American guys who love Saab. They seem like true enthusiasts. It is a great read. Below is a translation. They have visited Trollhättan twice, own ten cars with the Gripen logo and are horrified by the thought of a future without the Swedish car brand alive. For the New York-pair Clint Grimes and Alvaro Isla, Sweden and the endangered car brand have become a lifestyle. HARRIS, USA Just a few minutes ride from Bethel, where the first Woodstock festival was organized in 1969, there is a modest blue house with a garage. This is where Clint Grimes and Alvaro Isla take refuge on the weekends to escape the stress of Manhattan. And this is where the couple's impressive collection of Swedish cars is found. In total, the collection spans more than ten vehicles - all Saab. Here you can find everything from a 96 from 1969 to a brand new 9-4X. The car that stands out most is an orange Sonett III from 1973 - exclusively produced for the U.S. market. - Are you asking me to pick a favorite car? says Alvaro Isla and sighs. - That’s about as rude as to ask a mother to point out her favorite child. These cars are my children. The fascination for Saab has not always been there. The first time Alvaro Isla came into contact with the brand was in 1985. Then he loathed the model - an odd 900 - standing in front of him because "it was just too different." But after having owned a Saab 9000, which he later was forced to sell when he needed money for a venture in the restaurant business, the now 51-year-old Alvaro Isla had begun a lifelong love affair with the Swedish car brand. When the next car was to be purchased, the aim was pointing at precisely an odd Saab 900. The couple met 18 years ago and they joke about the fact that Clint Grimes already owned just a 900 was the "dealbreaker" to love. - Since then it rolled on. We bought a 900 turbo convertible, a 9000 with a lot of horsepower, the Saab 900 SPG. When Clint Grimes, who has worked as an engineer at General Motors, talks about the four-wheeled vehicles that are owned by the couple, he does so with a tone that is indicative of a tremendous love for Saab. If nothing else, it's a testament to the couple's two trips to Trollhättan (2007 and 2011) to meet other enthusiasts and visit the factory. Other evidence is all the clothes and stuff with the Saab logo and that they collect all the literature available about the car brand. - I just started trying to study Swedish in order to read all the books I have, and not just what is available in English. In addition, we want to continue taking part in Swedish culture, says Alvaro Isla and get nods by Clint Grimes. - Through Saab, we have discovered that Sweden is a totally unique country. It is fascinating that you with just 9 million people can make such a big impression in the world. At the house in Harris, which is about two hours' drive northwest of New York, they mostly dedicate themselves to disassemble the cars and then put them back together – and they are just as often "struck by the insight of how well made they are" as to "try to improve them." Quite often hours are spent on the Internet searching for original parts which the previous owner has disposed of. - As soon as you open up the cars you realize that they are anything but a BMW or Mercedes. They are extremely well made, everything is perfect and carefully designed, says Alvaro Isla. According to the couple that is precisely the advantage that is also Saab's biggest problem. That the cars are "made to perfection" means that costs increase and at the same time the consumers need to buy a new vehicle is reduced. Another problem they say is that General Motors chose to maintain a high price tag of Saab, despite an impaired sense of luxury, inter alia, "make the inside more plastic." - I am surprised that not more people are buying Saab, that the brand does not become more popular. But I am happy about it - I don’t want to stop at a red light and see Saabs everywhere. The feeling of exclusivity is a big part of my feeling about Saab, says Clint Grimes. According to him, the recent years have been somewhat of an emotional roller coaster. News that Saab will be saved from bankruptcy has turned into quite the opposite – and then soon after swinging back when a new lifeline thrown. Neither Clint Grimes or Alvaro Isla are reluctant to criticize the Swedish government which they believe should have acted more forcefully to save the pride of Trollhättan. At the same time, they want to give a dose of praise to Victor Muller for his hard work. - You can say a lot about Victor Muller, but if it wasn’t for him, Saab would already be closed. The company may not survive in the future, but they have at least kept it alive for some time and tried, says Alvaro Isla. The couple doesn’t sit idly by in the fight for a future for Saab.In order to support the Swedish car manufacturer, they recently bought Saab’s newest model, the 9-4X SUV, even though the money was actually reserved for a future 9-5 SportCombi. - We will continue to love Saab even if the company goes under, but it will not be the same thing, says Clint Grimes who has not given up hope of an eleventh Saab. -If the company survives, we will buy a 9-5 SC - that is our dream right now. The intense negotiations continue between Swedish Automobile and Saab and the Chinese companies Youngman and Pang Da over the sale of Saab. Now Swedish press has picked up the same piece of news presented here on Life with Saab on Wednesday, that CEO of Pang Da is on his way to Sweden, possibly already arrived. Also CEO of Saab and Swedish Auto, Victor Muller, is present in Stockholm and taking part of the negotiations, according to Swedish Radio P4 Väst. P4 Väst writes that their sources say that the negotiations have made progress the last days. Now the Chinese are more open to rethinking the ownership structure for Saab. Which probably is necessary for General Motors to still supply Saab with technology to build cars. The CEO and Chairman of Pang Da was reported saying that GM's attitude had "eased up" the past days. Which could be connected to Saab last week sending GM in-depth information with answers to GM's questions regarding the sale of Saab. But time is an issue. Or too little time is an issue to be exact. And now the parties want to postpone the creditors meeting planned on Tuesday November 22. At this meeting Saab is supposed to present a payment plan to its creditors. The question is if the court appointed administrator of the reconstruction is willing to apply for a postponement of the creditors meeting and if the court will allow it. PS: Swedish Automobile has released a trading update today. Nothing new there, but those who are interested can download it from Saab. 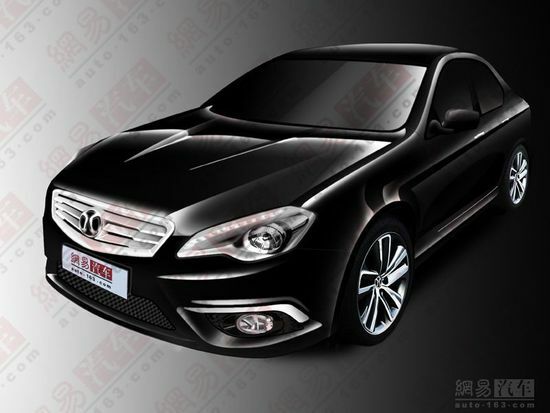 Next week at the Guangzhou Auto Show Beijing Auto Works will launch their previous generation Saab 9-5 based sedan, labelled C70. It was back in 2009 that Beijing Auto bought the old Saab 9-5 technology (1998-2010) to be used in several coming vehicles from BAIC. 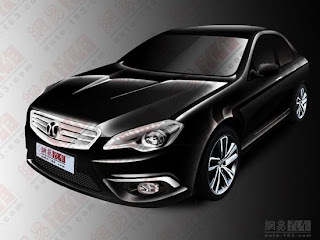 The first one being the BAIC C70. Next week the world can see what the Chinese have come up with using the old 9-5 technology. 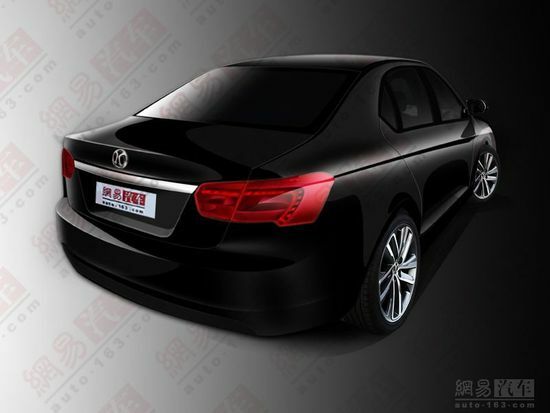 But auto163.com has decided to make a few impressions of what they think the car will look like. 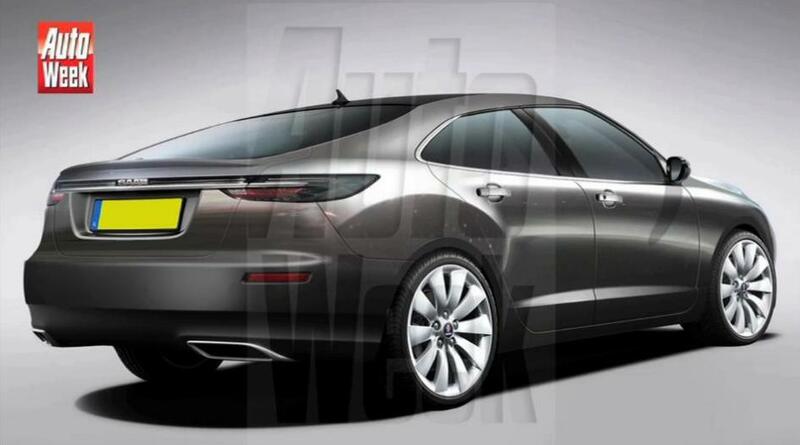 Next year will probably see a mega launch of other Saab based vehicles at the 2012 Beijing Auto Show. Here we can also expect to see what they have done with the old 9-3 technology. Just-auto reports that General Motors is declining to speculate on any timetable for the latest Saab crises to be resolved but says it has had "very regular" communications. "Saab, Youngman and Pang Da have their own set of negotiations regarding this sale and we are not party to that. We have had communications with Saab very regularly since they announced the proposed sale," a spokesman of GM told just-auto. "There is no real timetable for us - we have made a definitive statement so it is up to Saab and their proposed acquirers how they want to proceed. We will deal with that when the time comes - we can only react to something that is concrete." The spokesman continued saying that GM asked questions and got few answers at first, but as more information was available GM could not support the deal to sell Saab. "This has been a very lengthy and drawn-out process. There have been a lot of different ideas floated to try and solve Saab's financial crisis. I can't speculate about different scenarios. They presented a transaction at the 11th hour when the administrator was prepared to liquidate the company and we spent the next couple of days asking a lot of questions and getting precious few answers but, as we got more answers, it became very clear to us we could not continue to licence our technology, although we were willing to continue our supplier relationship." Chairman of Pang Da headed for Sweden, says GM "eased up"
As far as the general public knows, the negotiations between Swedish Automobile and Saab on one side, and the Chinese companies Youngman and Pang Da on the other, are still ongoing. 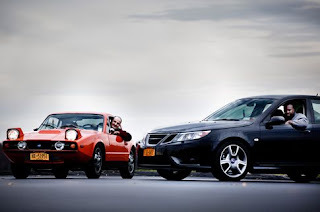 The goal is to reach an agreement for the sale of parts of Saab or 100 percent of Saab, that General Motors can accept and still supply Saab with the needed technology to produce the Saab 9-3, Saab 9-5 and Saab 9-4X. According to Swedish news agency TT, the Chinese are reluctant to go back to a deal where they only become part owners of Saab. And Pang Da is said to be the most reluctant party. So now the discussion are on the subject how much of Saab the Chinese want which also GM can accept, and of course also at which conditions. According to SinoCast, a business information provider with a focus on China, Pang Da made an announcement in late October that its Chairman had been entitled to be fully responsible for the talks with related parties, such as Swedish Automobile. Now the Chairman of Pang Da, Pang Qinghua, is on his way to Sweden. "Now GM's attitude has eased up, and I will head for Sweden to have further discussions about related problems," said Pang Qinghua. The deadline to reach an agreement could come next week, when on Tuesday November 22, Saab needs to present a payment plan for its creditors concerning the outstanding debt. If the cerditors are not happy, they can ask that the reconstruction is ended. Also the administrator of the reconstruction can ask the court to end the process if he thinks that there is no possibility to reach an agreement that will save Saab. PS: Pang Qinghua headed for Sweden and "GM eased up" are unconfirmed information so far. I do not know how credible SinoCast is! The Swedish magazine Position, which is a magazine for managers and decision makers published by the white-collar labor union Unionen, has awarded Peter Dörrich of Saab the Manager award of 2011. The award also includes a SEK 20,000 prize. The award will be presented today at the Competence Fair in Stockholm. "I want to know how my colleagues feel and how it is at home. Work and life at home are not two separate worlds. It is a whole. If one part doesn't work, then the other doesn't either," said Peter Dörrich when explaining his manager approach. Peter Dörrich is well worth to receive the Position's Manager award for 2011. 500,000 members of the Unionen have had the chance to nominate the most popular manager and of all the nominees, the magazine's jury has decided that he is the best. He is been hailed by both the fellow managers and employees and Unionen's representatives with words like "confident, encouraging, empathetic, determined, informative." He cares about all the individuals in his group, supports and pushes them, takes the time to listen and guides them to good results. In the turbulent situation that Saab has long been in, Peter Dörrich has been a safe and informative leader who has always been available and shown compassion. "I have really longed for such an assignment, to be given the responsibility, to accomplish something concrete to feel pride over. It has been a wonderful time!" Peter Dörrich has been at Saab since 1979. During this time he has worked for Saab and GM both in the USA and Japan. He currently holds the position of Vehicle Chief Engineer Compact & Mid-size vehicles at Saab. A big congratulations to Peter Dörrich! All the current Saab models use platforms or architectures developed under GM or by GM. But it differs to which extent this technology is owned by GM or Saab. The oldest Saab in the fleet, the Saab 9-3 which was launched as model year 2003 and reworked in 2008, uses the first generation Epsilon platform. According to Swedish technology news site, Ny Teknik, only parts of the technology in the current Saab 9-3 is owned by GM. 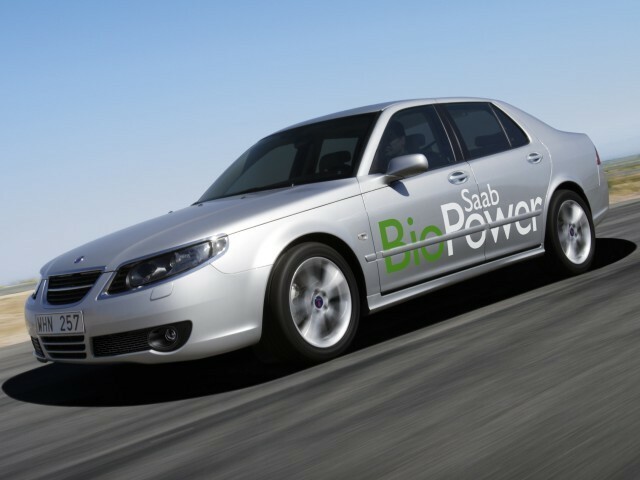 Saab has the rights to most of the technology, and can use the technology owned by GM without paying license fees. The Saab 9-5 which was launched as a model year 2010 car, is entirely based on technology owned by GM. Much of the technology was developed by Saab when Saab was owned by GM, but Saab still has to pay license fees to GM to use the 9-5 technology. 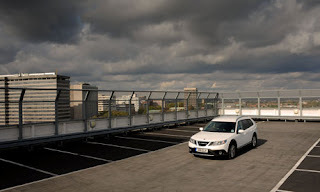 The new Saab 9-4X launched as a model year 2011 car, is also entirely based on technology owned by GM. And it does not just use GM technology, it is also built by GM in Mexico for Saab. So Saab doesn't even own the tools needed to build the car. The fact that GM owns all technology used in the 9-4X and 9-5, and some of the technology used in the 9-3, is of course the reason why GM's blessing is needed to sell Saab to the Chinese companies Youngman and PangDa. Without GM licenses, Saab can't build cars in the near future. And no cars means no incomes and a dead brand. But then what about the next generation of Saabs? I have already published an article about how the next generation Saab cars will be built on Saab's own Phoenix platform which has been in development since 2008. And also an article about the Phoenix platform actually still using some GM technology. But now let's look more into that. Here Ny Teknik is also our source of information. The first car scheduled to use the Phoenix platform is the Saab 9-3 replacement. If everything goes well, the car should launch sometime in 2013. About half of the components and technology of this car comes from external suppliers and subcontractors. Including a number of compenents and systems from GM. These are components and systems the developers at Saab have taken from the Saab 9-3 and 9-5 and that they from experience know to be good and reliable. These GM systems are so called competition-neutral components. Which means that the technology is no longer unique and gives no competitive edge. GM has the rights to these components because GM owns the tools used by the components suppliers. And therefore GM also decides who can buy the components. The reason why Saab decided to use these systems, except for the obvious reason that they know them from the current Saab cars, is because Saab saves a lot of money by buying finished components as opposed to Saab developing and building the components. When we look at the Saab 9-3 replacement, less than 10 percent of the components or 500 part numbers, are GM components. This means that if Saab is to build the Saab 9-3 replacement based on 10 percent GM components, Saab needs GM to approve the sale of these components. On the other hand, if GM says no, Saab needs to find new suppliers or develop the parts itself. And since the parts are more or less off the shelf components, it should not pose any big problem. Except that it would of course increase the cost and delay the launch date of the 9-3 replacement. So to conclude: Saab can not build any of the current models without GM's blessing, but future models based on the Phoenix platform can be built regardless of GM. Another aspect that has not been discussed here is engines deals. Currently Saab buys all its engines from GM, and in the 9-3 replacement we know that Saab will buy the base petrol engine from BMW. If both GM and BMW says no to selling engines to a Chinese-owned Saab, then Saab even needs to go shopping for new engines. But from where? And how will that increase the cost and delay the 9-3 replacement? 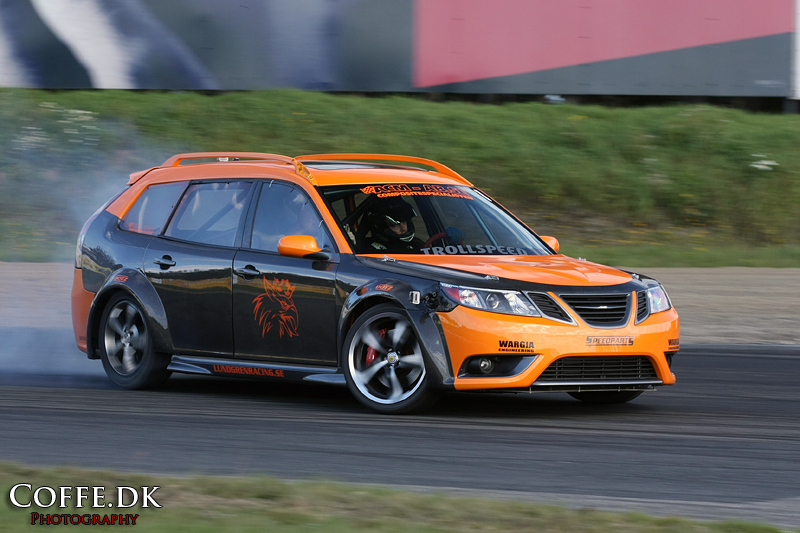 Here is a nice Saab 9-3 impression from AutoWeek, spotted by Tobias A! This impression was obviously based on the current Saab 9-5 Sedan, and does probably not look much like the next Saab 9-3. 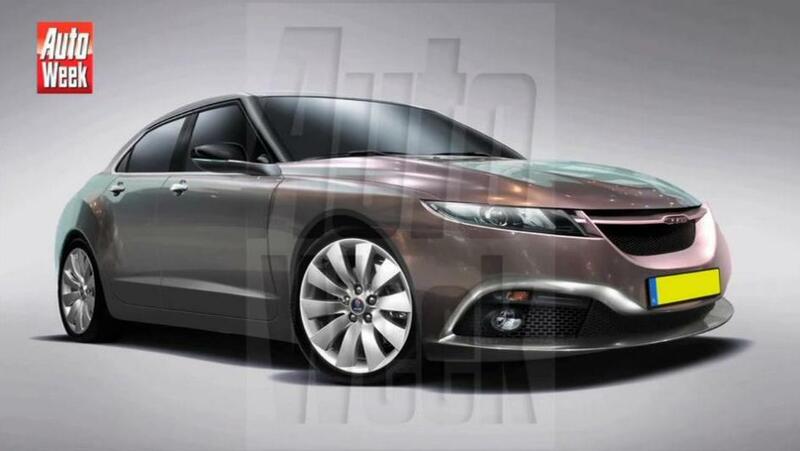 But it could maybe be close to a faceliftet Saab 9-5 Sedan to launch around 2013? Today the MoU sign between Swedish Automobile and Chinese companies Youngman and PangDa for the Chinese takeover of Saab, expires. But the parties have decided to continue the negotiations. "All parties have agreed to continue the discussions, but they won't officially sign a new agreement," said Gunilla Gustavs, spokeswoman at Saab Automobile. Monday last week General Motors (GM) announced that if the MoU to sell Saab to the Chinese companies was followed through, GM would end all license agreements with Saab. And that is why the parties are back at the negotiation table. The hope is that they can reach a sale agreement that GM can accept. "It is vital that we can agree on a new ownership structure that GM can approve," Gustavs said. Last week GM got an information pack with answers to all the questions GM had raised concerning the Chinese takeover. "GM got answers to all its questions last Friday and has had the weekend and Monday to go through the material," Swedish newspaper Dagens Inudstri quoted a source at Saab saying. "It would be strange if they didn't agree to negotiate." When Swedish Automobile sign a memorandum of understanding (MOU) with Chinese companies Youngman and Pang Da for the sale of Saab Automobile, the sales deal was made valid until November 15. Since then General Motors (GM) has said that should Saab be sold to the Chinese, GM will revoke all technology agreements with Saab. Something that would make it impossible for Saab to keep manufacturing the Saab 9-5 and Saab 9-3. And Swedish Automobile, Saab and the Chinese had to negotiations. "The date for the MOU feels very undramatic. As long as all parties are negotiating, they can extend the validation of the MOU," said Gunilla Gustavs from Saab to Swedish news agency TT. Later Eric Geers, Executive Director Communications at Saab, confirmed to Svenska Dagbladet that the negotiations will continue beyond November 15. "Saab will continue talking with the Chinese also after November 15, that's all I can say. I do not know if we will release an official statement, but that is the status," Geers told SvD. He also said that it is very important that the Chinese also can reach an agreement with GM. Most countries in the EU require that vehicles three (or four) years or older, every year or every second undergo a vehicle inspection to check that the vehicles conform to regulations governing safety, roadworthiness and exhaust emissions aspects. In the UK this test is known as the MOT test (Ministry of Transport test), in Norway the PKK (periodisk kjøretøyskontroll), in Germany the HU (Hauptuntersuchung), in Sweden the besiktning, in the Netherlands the APK (Algemene Periodieke Keuring ) etc etc. In Sweden the test authorities, AB Svensk Bilprovning, makes summaries of the results for all car models. The latest statistics are from 2010. And here we also find Saab. Below is the 10 car models with the least faults when looking at cars that were 5 years old (model year 2005 cars). The 2005 Saab 9-5 Sedan with petrol/E85-ethanol engine is among the absolute best cars. Only 0.1 percent of the Saab 9-5s with this engine failed due to car related faults. As a comparison, 26.9 percent of the Volvo V70 diesel failed. If you look at the full list, the Saab 9-5 SportCombi with petrol/E85-ethanol engine also do well and is placed 31st with 2.1 percent fail. How far the car has been driven and how well you service and care for your car will of course affect the result on this test. But it is always nice to Saab do well! Today Swedish Automobile, which is the current parent company of Saab Automobile, held an extraordinary general shareholders meeting. At this meeting the shareholders were briefed that if a deal with the Chinese can't be reached within shortly, Saab is in danger of bankruptcy. But there were no reports of any break through in the negotiations with the Chinese suitors Youngman and Pang Da, or with GM which earlier has refused to sell technology to Saab should Saab be sold to the Chinese. Dagens Industri writes that shareholders present at the general meeting now reports that Swedish Automobile is working to extend the current memorandum of understanding with the Chinese so that negotiations can continue beyond November 15. The aim now seems to be to return to an agreement where the Chinese become only part owners of Saab, instead of taking full ownership over Saab. The ownership structure of the original deal of July was "very carefully crafted" Muller told the Wall Street Journal, with three large minority shareholders, non of which had control of the company. But then the Chinese instead wanted to buy 100 percent of Saab Automobile, which GM could not accept. Now the parties are trying to find a new ownership structure that GM can accept, but the old from July is "off the table." On Thursday this week Saab sent over and an information pack to GM to clarify any misunderstanding or questions GM might have concerning Saab's China plans. Among other thing a clarification whether the current Saab 9-3 and Saab 9-5 are planned to be manufactured in China. So now once again Saab is waiting for a response from GM. At the same time Saab's current CEO Victor Muller tells TTELA that now even the Swedish government with the new Minister of Enterprise has gotten involved in persuading GM to accept a deal where the Chinese take a stake in Saab. In other words, still lots of uncertainty. The only certain thing in the world of Saab is that the next week will be very interesting. After General Motors (GM) on Monday single-handedly stopped any chance of the current deal where Chinese companies Youngman and Pang Da acquire Saab, the negotiations are now believed to be back at the July agreement. In this deal Youngman will buy 29.9 per cent of Saab's current parent company Swedish Automobile, and Pang Da 24 per cent. According to Svenska Dagbladet, this deal is much more likely to get thumbs-up from GM than the deal where the Chinese buy 100 per cent of Saab. The newspaper goes so far as to say that according to Victor Muller this solution was approved by GM. And with this deal Saab's current CEO, President and Chairman of the Board, Victor Muller, will remain owner of 27 per cent of Saab. "Time is a factor here of course," a Saab spokeswoman told just-auto, commenting on the concern that the current memorandum of understanding between Saab's current owner Swedish Automobile and Youngman and Pang Da is valid only until November 15. "GM is definitely a part of the dialogue - I can't characterise it more precisely than that. It is not as if everything is being discussed without GM. We are understanding GM's position - we are looking for a structure that can be agreed upon. GM has some specific points they would like clarified," Saab spokeswoman told just-auto. Another hurdle that needs to be passed is the National Development and Reform Commission, the NDRC, which is China's top economic planning body. The question is how the NDRC assess a deal where the Chinese do not get full control over Saab. But the worries does not end there. Another questioned that has been raised this week is concerns about the financial situation of one of the suitors, Pang Da. According to news reports Pang Da has in just six months burned through 6 billion yuan (approx $945 million). The reason is said to be that the company has changed its business model. The company is now out in the market to raise another 3.8 billion yuan ($598 million) after it was approved by China's Securities Regulatory Commission to sell bonds. But according to Svenska Dagbladet, which spoke to China expert Frederic Cho from Handelsbanken Capital Markets, this is no issue. If the NDRC approves the deal, the deal will be financed by the Chinese state. And a decision from the NDRC on the matter is expected towards the end of this month. After General Motors (GM) on Monday this week made it clear that it will not continue its technology agreements with Saab should Saab be acquired by Chinese companies Youngman and PangDa, intensive talks have taken place between Saab and its current owner Swedish Automobile and the Chinese suitors. According to Saab, the company is now preparing additional in-depth information packs to GM, to provide GM with answers to issues surrounding the planned sale of Saab. The management at Saab is preparing information which clarifies the new business plan and intentions for the future. The aim is to present this to GM, in order to clarify what the intentions are with the operations in China, and thus seek GM's consent to the transaction through discussion and negotiation.